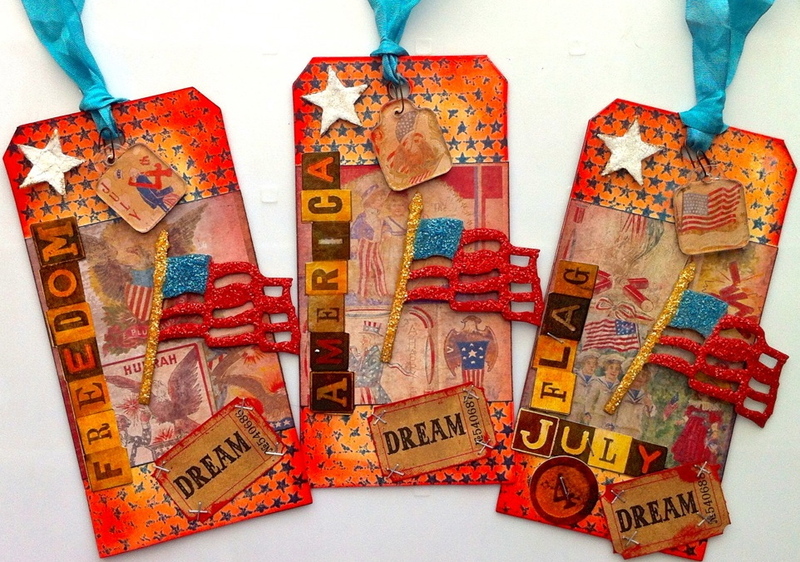 Donna's Crafty Place: Happy July 4th!! Hi everybody! I just wanted to pop in today to say I hope you all who are in the USA have a great 4th. I made 3 tags for my Tim Holtz group Patriotic Tag swap. I thought I would share them with you today. They all use tons of Tim Holtz papers, inks, fibers, glitter and embellishments. Thanks for stopping by and have a great day! Click here to check out my monthly blog candy post and leave a comment for a chance to win!! these are great, I love the use of colours and the way you have done the sentiment 'freedom' is fab-are these cut out? WOW...love these, especially the inking and those awesome flag embellishments! So cool! Super fun designs Donna! Love the glitter! These are incredible! I love all the little details! Fantastic how you've pieced all the words together! these are awesome, happy 4th to you too...hope you have a wonderful week!